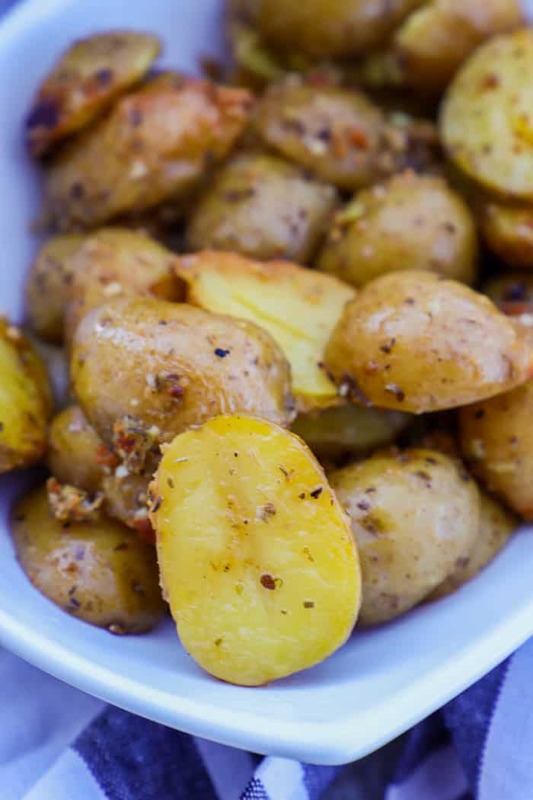 Tossed with seasonings, garlic, and parmesan cheese these Slow Cooker Parmesan Garlic Potatoes make the perfect side dish. 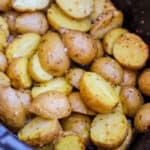 Potatoes are the perfect side dish recipe that goes with any dinner. It’s also my kid’ss favorite side dish. Even though my five-year-old always calls them tomatoes. When I tell him we are having potatoes, he usually asks if we are having white tomatoes or red tomatoes. It makes me laugh every time. 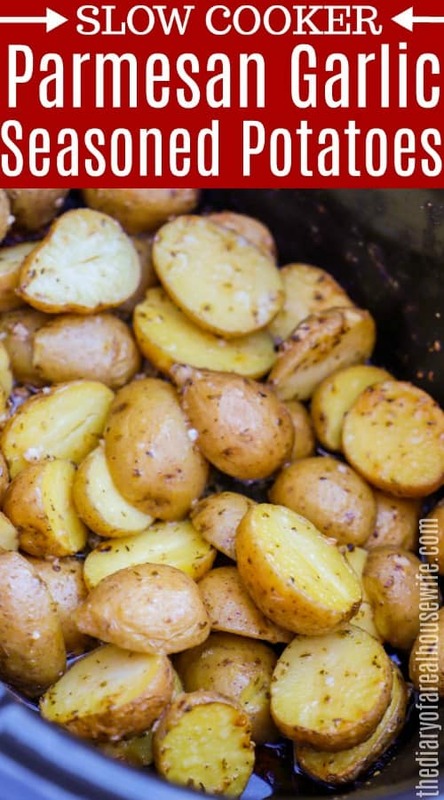 These Slow Cooker Parmesan Garlic Potatoes are so simple to make and one of my favorites. I just toss them in seasonings then cook them in my slow cooker. Step one: Start by preparing your potatoes. I washed and then slice your potatoes in half. Once they are prepared you an place them in your slow cooker. Step two: Whisk together oil with remaining ingredients then more this over all your potatoes in your slow cooker. Mix well until all potatoes are coated. Step three: Cook until potatoes are tender and cooked through. Serve warm and enjoy. 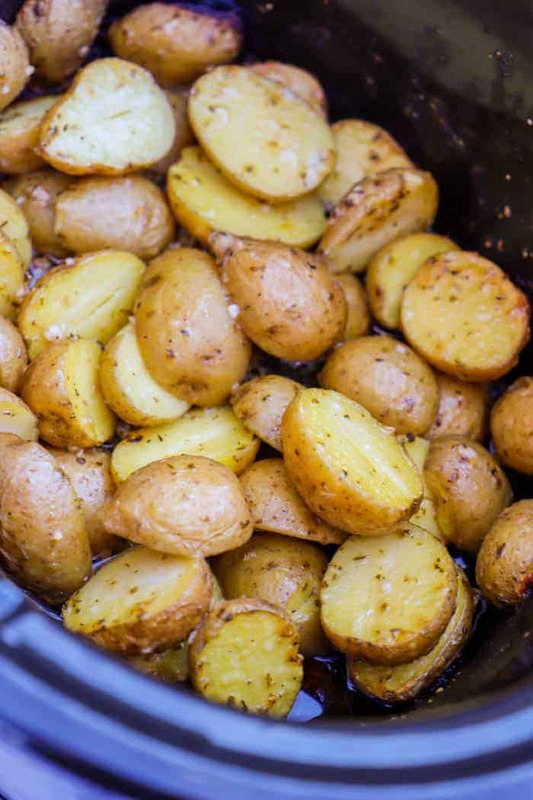 Wash and slice potatoes then place them in your slow cooker. Whisk together oil with remaining ingredients. Pour over potatoes and then mix well until all potatoes are coated. Cook on low for 3 hours or on high for 2 hours. Until potatoes are tender and cooked through. Serve warm and enjoy. Oh my! That looks delicious! I am a HUGE fan of slow cooker meals – being a mom convenience is a must! Thank you for sharing! Thanks for stopping by Ashley!I I agree it is, every mama needs a slow cooker in her life! !